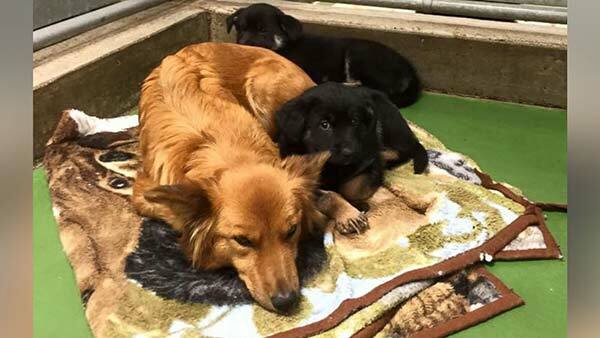 ST. ALBERT, Canada -- At a Canadian pet motel and foster care center, a dog broke out of his kennel to comfort and cuddle with two new, frightened, foster puppies on their first night, ABC News reports. Maggie, the maternal dog, actually had a litter of her own who were all adopted out of the humane society a little while before she found a loving home. "We think that's why she got so attached to the puppies," Alex Aldred, who works at Barker's Pet Motel and Grooming, where the heartwarming events unfolded, told ABC News. "We've never really seen it before, where a dog sneaks out to some puppies and is so excited to see them."